Unlock the adult brain's surprising potential--and look radiant from the inside out! Have you lost your healthy glow and that sparkle in your eyes? Is it becoming harder to recall names, faces, and where you left your keys? Has your life become routine? Are you so overwhelmed by work, family, finances (or all three) that you feel exhausted at the end of every day? If you answered "yes" to one or more of these questions, chances are you are in need of a brain/beauty makeover! Beautiful Brain, Beautiful You is for any woman who suffers from "Bad Brain Days." Harvard neurologist Marie Pasinski, M.D., gives women lifestyle advice proven to help them look younger and healthier without a trip to the cosmetic counter or plastic surgeon. Dr. Pasinski will show you how to tap into your brain's remarkable ability to change and redesign itself, giving you better mental clarity, as well as more energy and confidence. She will reveal how a sharper, stronger, and healthier brain can transform your life--at home, at work, and at play. 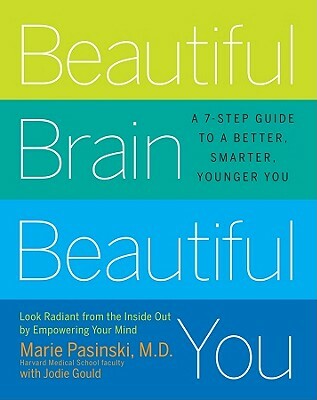 Beautiful Brain, Beautiful You explains why beauty begins from the inside out. When your brain isn't at its best, you can't look your best. With its inspiring, easy-to-follow program and compelling scientific evidence, this breakthrough book will help you think, look, and feel ten years younger. Marie Pasinski, M.D., is a staff neurologist at Massachusetts General Hospital in Boston and faculty member at Harvard Medical School, and one of the leading experts in the field of Neurology. Dr. Pasinski graduated Harvard Medical School and completed her residency at Brigham and Women's Hospital in Boston. Since 1991, she has been the consulting neurologist for the Massachusetts General Health Care Centers, where she cares for patients with a broad range of neurological symptoms and disorders. Jodie Gould is an award-winning journalist and author of six books including Date Like a Man: To Get the Man You Want. As a former book publicist, Jodie has worked with numerous bestselling authors, including Barry Sears, Alan Dershowitz, Erica Jong and Gloria Steinem. Jodie's articles have appeared in Family Circle, Woman's Day, Cosmopolitan, Elle, Redbook, First for Women, American Health, The New York Times Syndicate, The New York Observer, Newsday, and many other publications and Web sites. Jodie has a master's degree in journalism from Columbia University, where she was awarded a Pulitzer Fellowship and an Alfred I. du Pont Fellowship for Broadcast Journalism. She won the 2003 MADD Media Award given by Mothers Against Drunk Driving for her Family Circle article on spring break. Jodie's Web site is www.jodiegould.com.